This seems worth pointing out given the recent High Line opening in New York City, a project which turns an elevated railway bed into a park: Local architect John Dutton, author of "New American Urbanism: Re-forming the Suburban Metropolis," was recently honored by the Westside Urban Forum for his "New Los Angeles Greenway" poposal, which looks to turn the 10 Freeway into a grassy and pleasant stretch of promenades, vertical farms, bike lanes, and transit hubs. Actually, Dutton wants to take back all of the city's freeways. In an email, he writes: "My argument is that freeways are at the tipping point, that they are the inevitable ruins of the future and why wait to reclaim them. All great cities reuse obsolete infrastructure." After the jump, Dutton explains the project in a bit more detail. Meanwhile, someone better get on the horn to Mapquest to warn them. First off, did you do actual studies that would look at irrigation, for example, or the effect of a project like this on the existing concrete, or is this proposal more fantastical? "We see the Greenway as more of one long sinuous development parcel as opposed to an explicit reuse of the actual freeway structure/concrete," he writes in an email. "Certainly the light rail would require new infrastructure. 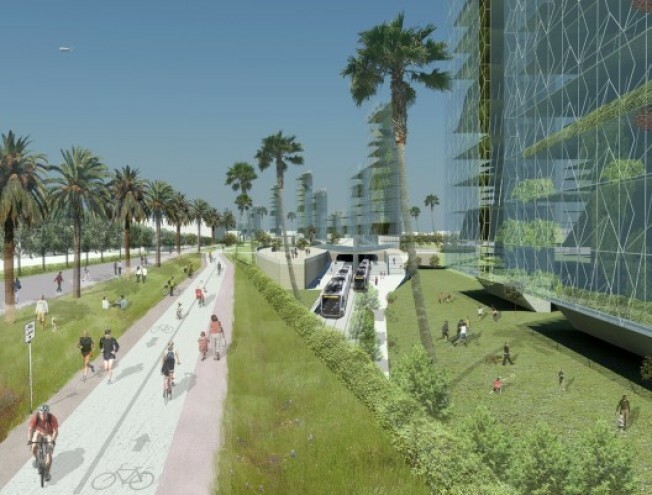 Reusing the freeway concrete for walkways, garden walls, foundations for the vertical farms and as the building elements of the new public squares and transit hubs would make a lot of sense." According to Dutton, a good portion of the old banks of the freeway could remain. "We see it almost as the Los Angeles version of the Seine, where Parisians can move up and down the banks of the river, and walk along it. We have even thought that there could be a series of kiosks along the banks where residents can individually sell their produce in the same way that booksellers border the Seine." As far as irrigation, the Greenways could also serve as a major water retention pit in places, both above in occasional ponds, and below grade in large retention wells." You can see more about the project and download information about "New Los Angeles Greenway" on Dutton's web site. Update: More about Dutton from his bio: Before founding Dutton Architects two years ago, Dutton worked as a partner at Nicholas.Budd.Dutton, were he worked on residential and commercial projects. Previously, he worked at Moule & Polyzoides, where he worked on new towns in Texas and New Mexico, as well as downtown plans for Beverly Hills and Downtown. He’s also the former president of the Los Angeles Forum for Architecture and Urban Design.